Hire us and sell tickets, it's a great way to raise money for your club, society or charity. Ceilidhs are a great way to have fun at your wedding or party. We play for sets of simple dances making it fun and easy for all. For an event we typically play through about 20 tunes. They are all bright with a strong rhythm and easy to dance along to. Some guests prefer to sit and listen and we always play a different tune for each dance. 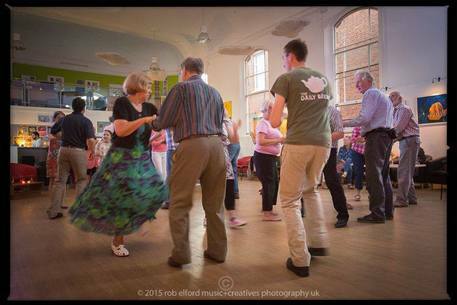 Ceilidh dancing is a great deal of fun, energetic and a wonderful way to get your party guests socialising. We've hundreds of dances to hand, all simple to learn and satisfying to dance. For every ceilidh we include a caller who acts as the MC for your evening. They teach the dances, help everyone feel at ease and ensure everyone can enjoy the music and dancing.